In Sub-Saharan Africa, many food security programs aim to increase crop yields by developing and disseminating better seeds and agronomy to millions of smallholder farmers. In the case of maize, research and development organizations use key indicators like grain yield, or maize cob number and size to understand the performance of the maize plant under different environmental conditions. But these indicators are still labor-intensive and expensive to measure. 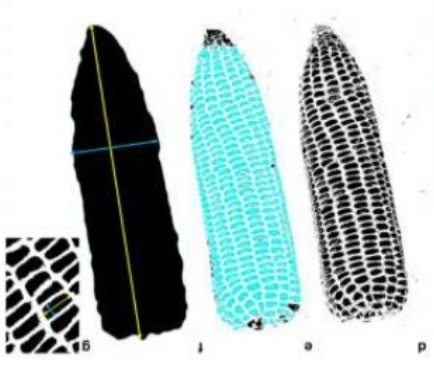 CIMMYT has developed a digital imaging tool called Maize Ear Analyzer that collects maize cob and grain parameters 90% faster than traditional methods (Makanza et al, 2018). This imaging tool can be adapted to other crops. Zelalem Bekeko, Chemeda Fininsa, Dagne Wegary, Temam Hussien, Shimelis Hussien and Belachew Asalf. 2018. Combining ability and nature of gene action in maize (Zea mays L) inbred lines for resistance to gray leaf spot disease (Cercospora zeae maydis) in Ethiopia. Abstract: Ten elite maize inbred lines were selected based on all over per se performance and resistance to gray leaf spot (GLS) disease. 45 F1 single cross hybrids were evaluated with three replications compared to three commercial checks. All the necessary yield, agronomic and GLS disease data were recorded. In all the studied traits highly significant genotypic differences were observed indicating the existence of genetic variability among the crosses. Among all inbred lines, five were identified as promising sources for GLS disease resistance. Analysis of epidemiological data and disease progress helped narrowing down to three populations that combine good yield, yield related traits and GLS disease resistance. Thus, these parents were recommended to be used in breeding programs and four potential high yielding and GLS resistant single cross hybrids were identified (CML-395/CML-383, CML-395/Sc-22, CML-395/CML-197 and CML-383/CML-197). Therefore, it is recommended that these hybrids can be used for direct production where this disease is the most prevalent and/or for further breeding programs in generating novel hybrids for future use. Setimela P, Zaman-Allah MA, Gasura E, Cairns JE, Thierfelder T, Prasanna BM. 2018. When the going gets tough: performance of stress tolerant maize under conservation agriculture during the 2015/16 El Nino season in southern Africa. Abstract: The 2015/2016El Niño was the most severe on record in southern Africa and was associated with drought and heat stress. To help farmers to cope with such extreme production constraints the International Maize and Wheat Improvement Centre (CIMMYT), has been developing multiple stress tolerant maize varieties through a rapid-cycle breeding strategy. These CIMMYT stress tolerant maize hybrids were evaluated using two types of trials. The first one comprised a regional on-farm trial with forty maize varieties (20 early-intermediate and 20 intermediate-late varieties), planted across 30 locations in four countries in southern Africa. The second set comprised a multi-locational evaluation trial with six hybrids that were tested under conventional ridge tillage (CP) and conservation agriculture (CA) using a randomized block design with each farm as replicate in nine extension planning areas (EPA), across two years. CIMMYT stress tolerant varieties outperformed non stress tolerant varieties. CZH142020 (5.6 t ha −1) and CZH131008 (4.8 t ha −1) had significantly higher yield advantage over commercial control varieties (<4.5 t ha −1) in both early and late maturity groups. They also had larger grains and smaller ear uniformity index (EUI) (calculated as among plots ear size variance); compared non-stress tolerant varieties. In the CA/CP evaluation trial, varieties under CA yielded ≥0.7 t ha-1 more grain compared to those under CP. Therefore, combinations of climate-smart agriculture technologies are required to mitigate negative effects of extreme events like El Niño and increase resilience of low-input farming systems.